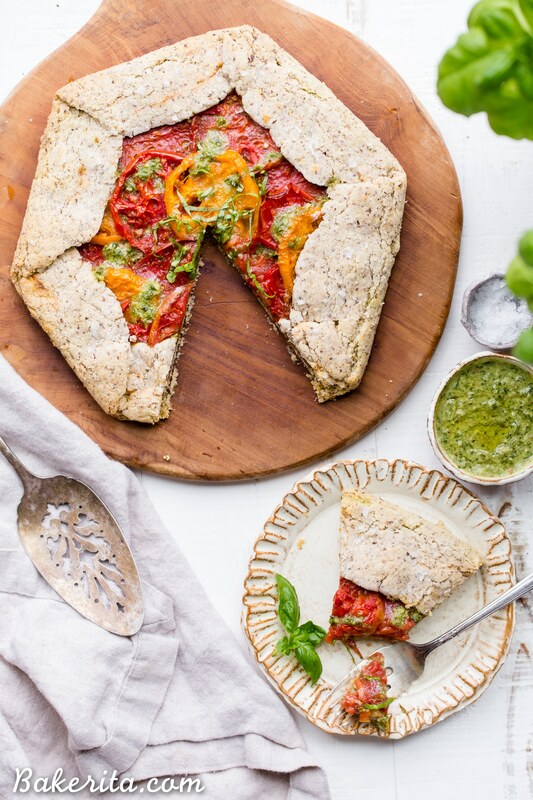 This Pesto + Heirloom Tomato Galette has an incredibly flaky, savory crust filled with homemade pesto and thick slices of heirloom tomatoes. Served warm, it’s a truly delicious appetizer or meal that you’d never guess is gluten-free, paleo, and vegan. I’m clinging onto summer with this recipe – I had to sneak one more in before the inundation of all things pumpkin spice, apples, and caramel. Not that I’m not excited for that, but heirloom tomatoes are still very much in season in this Indian Summer we’re (always) experiencing in San Diego and it was a tragedy that they had not yet worked their way into a recipe this season. So, I’m remedying that. In an incredibly delicious way. I’m hoping you’ll love it as much as I do, so make sure you go out and grab some of the most beautiful heirloom tomatoes that you can find as soon as possible because you don’t want to let this one slide. Galettes are one of my favorite things to make, but a lot of people don’t know what they are. I like to describe them as a lazy person’s pie – no pie tin necessary, and no struggling to get a slice out of the pan. There’s also lots of crust, which I’m alllll about, especially when it’s as flaky and delicious as this crust is. 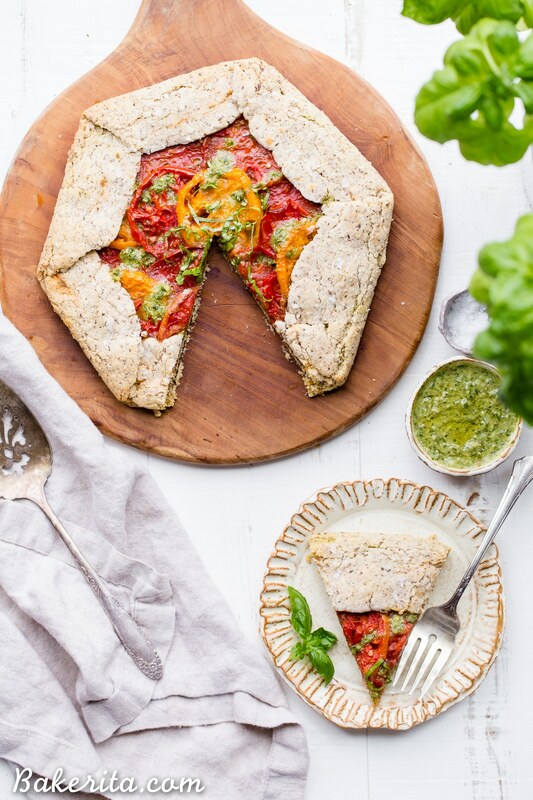 The crust is made with a combination of almond flour and tapioca flour, which combine to create a light, flaky, delicious texture. I added some nutritional yeast and salt for flavor, and those two ingredients almost make the crust taste like it has some Parmesan in it. Coconut oil is worked in to give that flakiness, and then it’s all brought together with some cold water. 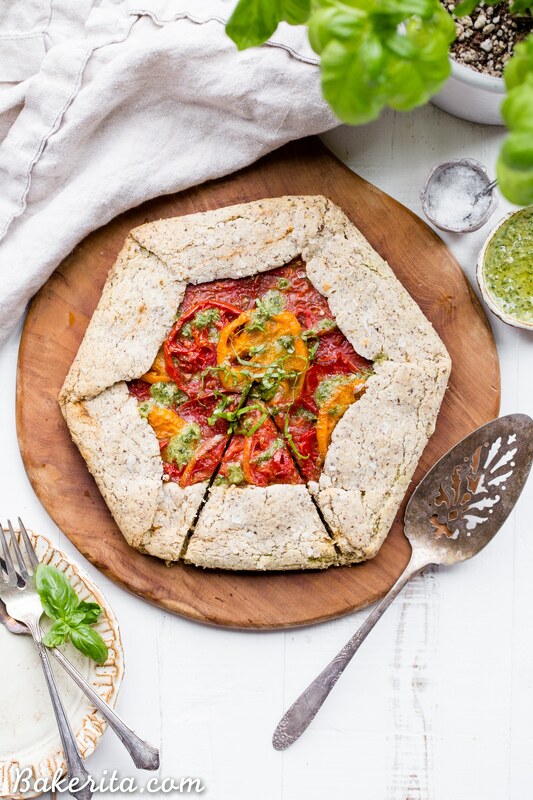 I roll the crust out immediately – no need to chill it in the fridge, and then layer on all the savory summer goodness. I make my own pesto most of the time and I’ve provided the recipe I used here – it’s pretty simple and super delicious. You can also use storebought pesto if you’d prefer or don’t have all the ingredients on hand to make your own. If you make my recipe, you’ll have some extra to put on anything (and everything) that you like. 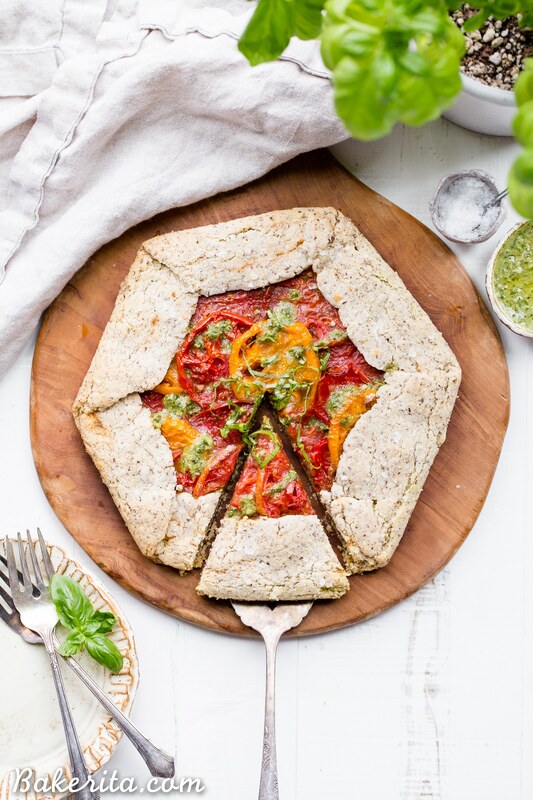 The pesto is slathered onto the galette dough, leaving a little room around the edges to fold the dough up, and then thick slices of beautiful, juicy heirloom tomatoes are layered on top, overlapping each other slightly. The dough is folded up, brushed with olive oil and sprinkled with flaky salt, and then the whole thing is baked until golden brown. Once out of the oven, I like to drizzle with some more pesto (thinned out a bit) and serve warm. I find it’s best when served fresh, but it can also be stored in the fridge and reheated in the toaster oven, regular oven, or microwave. I (somehow) still had some left about 5 days after I made it and it was STILL good, and that was reheated in the microwave. To be honest, I doubt it’ll last that long in your house – it only lasted so long in mine because I’ve been sick and not eating ALL THE THINGS for once. I hope you’ll embrace one of these last summer recipes before we delve into all the fall goodness! It’s truly one of my new faves. Love you guys so much and hope you enjoy!!! 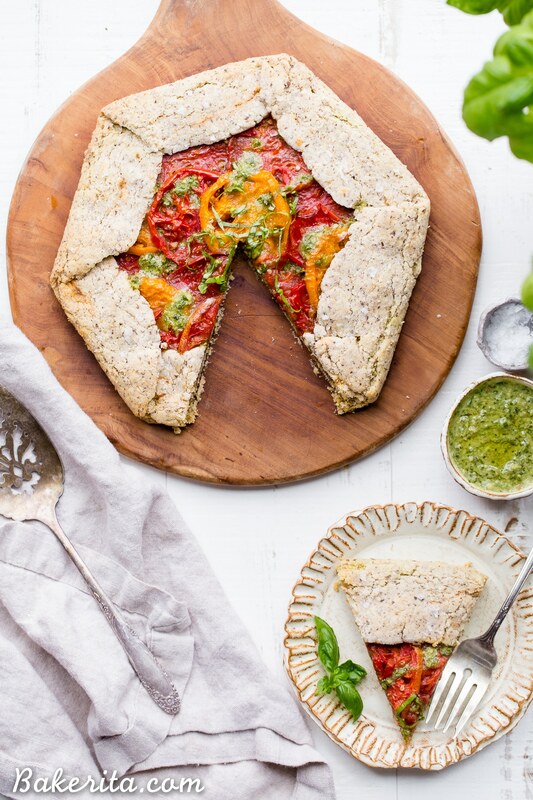 This Pesto + Heirloom Tomato Galette has an incredibly flaky, savory crust filled with homemade pesto and thick slices of heirloom tomatoes. Served warm, it's a truly delicious appetizer or meal that you'd never guess is gluten-free, paleo, and vegan. Combine all of the ingredients for the pesto in a food processor or high-powered blender (I used my Vitamix). Pulse on low speed until the ingredients come together. Make sure to scrape down the sides if you’re using a food processor. If you’re using a blender, keep the motor on low and use a tamper/scrape down the sides to make sure your pesto doesn’t become too smooth - you want the ingredients broken up into little bits, but not completely smooth. Adjust salt, pepper, and lemon to taste. Store in a jar. Combine the almond flour, tapioca flour, ground flax, nutritional yeast, salt and coconut oil in a food processor, or use a pastry blender in a bowl. Pulse or blend until the texture resembles a coarse meal, with small bits of coconut oil remaining. Add 2 tablespoons cold water and pulse/mix again until dough comes together. You might need to add 1 to 2 more tablespoons of cold water. If you’re mixing in a bowl, you may want to use your hands to bring the dough together at the end. Roll the dough out between two pieces of parchment paper into a circle, about 10-11” across. You want it thick enough to be able to hold the filling and fold up the sides. Slide the parchment paper onto a baking sheet. Spread the ⅓ cup of pesto in the center of the dough, leaving about 2 inches around the edge empty. Arrange the tomato slices over the pesto, overlapping them slightly. Gently fold the sides up, creasing the dough together with your fingers as you go. If your dough is a little crumbly, just press it together with your fingers - this dough is a little harder to work with than gluten dough but it’s easily pressed back together! I use the parchment to help fold up the dough so it didn’t break. Brush the outside edges of the galette with the one tablespoon of olive oil (gives it a little sheen and helps it brown). 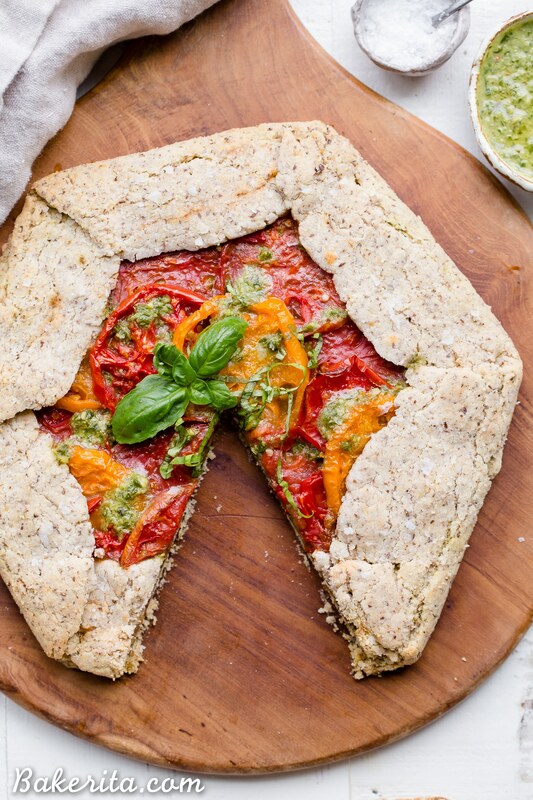 Sprinkle the crust with some flaky sea salt. Bake for 50 to 60 minutes, until the edges are golden brown. Remove from the oven and let cool for 10 minutes before slicing and serving. Top with a little extra pesto and fresh basil before serving, if desired. Store leftovers tightly sealed in the refrigerator. Reheat in the oven, toaster oven, or microwave. This looks AMAZING Rachel!! I can’t wait to try it!!! Thanks so much for the love, Megan!